Alan Gilzean was a truly great footballer, winning the league with Dundee and four trophies with Tottenham Hotspur. In his prime, the Leeds United manager Don Revie described him as the best touch player in Europe; even after his death in July 2018 the spine-tingling refrain of the Spurs fans who idolised him continues to echo down the generations: Gilzean, Gilzean, Born is the King of White Hart Lane. 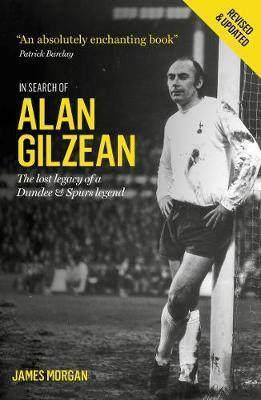 After a fan on a Spurs internet forum claimed that Gilzean was living as a down-and-out, James Morgan, a sports journalist and lifelong Tottenham fan, set out to separate fact from fiction and restore the legacy of an iconic footballer. Why was Gilzean not in the Scottish Football Hall of Fame? How had his name become forgotten in his hometown? And what had stopped him from returning to his throne at White Hart Lane? James Morgan is a sports journalist with The Herald, Scotland's leading quality newspaper. Born in Northern Ireland in 1974, he grew up on stories of the great Spurs double-winning team of the 1960s and has been a Tottenham Hotspur supporter since waking one Christmas morning to discover a hair shirt of an Admiral kit waiting for him on the living-room settee. Thirty-two years on, he is still waiting for Spurs to repeat the feats that his late father, Jim, was so enamoured by. He wrote In Search Of Alan Gilzean during the months after his first child was born; in the few short hours between nappy changes, bottle feeds and bath times. There were, of course, floods of tears along the way. Some of them were even his son's.